You don’t need to sit and wait on your potential clients to take the initiative – YOU have the power to take it for yourself when you use Facebook Advertising. 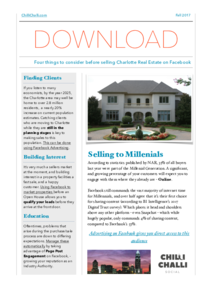 You can identify people who are looking to buy a home in Charlotte – even the ones that haven’t yet set foot in the Queen City. You can precisely know a Buyer’s likelihood to buy a property – before you know their name. You can market Listings to them without knowing where they live. It almost sounds too good to be true – but it’s not magic, it’s technology. The MOST IMPORTANT part of the equation is to take advantage of this technology before anyone else does. Act. This option is brand new and offers the Entrepreneurial Realtor an opportunity to be a front-runner. If you’re interested in taking advantage of this before your competitors do, then email us, or schedule a free discovery call to find out how you can use Facebook Advertising to take your Real Estate business to the next level. We understand the enormous opportunity that Realtors currently have, and we’d love work with you to get the results that we know are possible.